Nevertheless, a concert of operatic arias and scenes, or a complete concert performance would not have been impossible, of course. 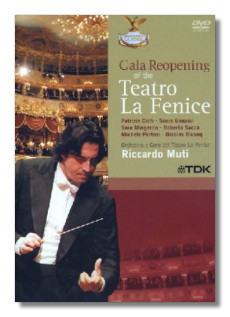 Instead, conductor Riccardo Muti chose a program of a different sort. After leading those assembled in the Italian national anthem, Muti presents Beethoven's Consecration of the House Overture, a reasonable enough choice for the occasion, except it is not one of the composer's best works. The rest of the music is associated with Venice in one way or another. Stravinsky loved "La Serenissima" and wrote several works for it – but not, it must be said, the Symphony of Psalms, which was written for the Boston Symphony Orchestra! Stravinsky is buried in Venice, however. Wagner actually died there, although it is questionable how much the two marches included here have to do with Venice. (The Kaisermarsch even includes a quote from "Ein feste Burg ist unser Gott.") Antonio Caldara (1671-1736) was born in Venice, although he spent much of his career in Vienna. And so it goes. Presumably the Caldara was programmed in order to give eight fine operatic soloists to do, although the work is barely ten minutes long, so they don't get to do much! I guess this is a DVD one purchases to celebrate the occasion; the only masterpiece here is the Stravinsky, which is performed well, but without the crispness it seems to require. (The choral singing is lovely, though.) The Caldara is something of a tease. About the Beethoven and the Wagner, one can say that the musicians try and almost succeed to make a silk purse out a sow's ear. I'm not sure that eschewing the incipient vulgarity of the two marches by Wagner is entirely a good thing, though! The sound (stereo, Dolby Digital 5.1, or Dolby Surround 5.1) and picture (4:3 aspect ratio) are excellent. There are no bonus features. Your move.